Rock Chick Nails! Who doesn’t love a bit of sparkle? Well these sparkly purple nails are definitely most at home on the floor in front of a rock band. I did these nails for when I went to see 30 Seconds To Mars and my friends all loved them! I used Barry M’s Vivid purple paint and their Diamond Jewel Glitter Nail Paint on a few of the nails, making some extra sparkly! 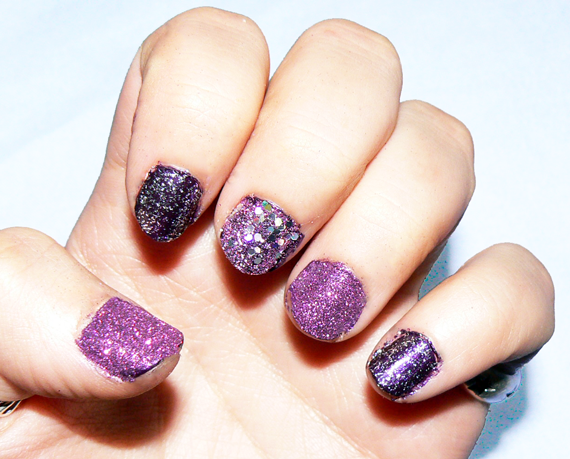 On the rest I used W7 Nail Bling Nail Art Glitter Set which was really easy to use and apply and looked fantastic on! I used a magazine under my nails when I did them so I could easily pour the glitter onto the second coat of nail polish and then I was able to tip the spare glitter back into the tubs. I will definitely be using these sets again as they make doing your nails easy and good fun. Previous Post Black Cut out Boots Top 3 from Ebay, Very and New Look! Next Post Winter Glam Wishlist – perfect party pieces!